“Love is the master key that opens the gate of happiness.” ~ Oliver Wendell Holmes Sr. I hope you enjoyed Part I of “Romance Is In The Air,” (if you missed it ~ visit here). 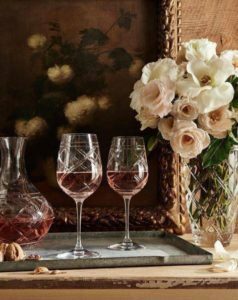 While we can’t all enjoy a romantic Valentine’s Day evening and dinner in Ravello, Italy, we can create romance and cook up a little magic in our own homes. My husband and I gave up fighting crowded restaurants on Valentine’s Day many years ago. Because, to us, there is nothing romantic about being in such a situation. So, today I am sharing a wonderful and easy menu, complete with recipes. A lovely dinner at home, truly what memories are made of. Note: This recipe serves 6. However, I make the same amount of sauce for 2, and there is just a little left over. If you have sauce lovers, and are serving 6, I would double the sauce. Place the filets on a board and pat them dry with paper towels. Sprinkle the filets with salt and then press the black pepper evenly on both sides. Allow them to rest at room temperature for 15 minutes. Heat olive oil and 1 1/2 Tbls. butter in a large saute pan over medium- high heat until the butter almost smokes. Place the steaks in the pan and lower the heat to medium. Saute the steaks for 4 minutes on one side and then for 3 minutes on the other side, for medium rare. Remove the steaks to a serving platter and cover tightly with aluminum foil. Meanwhile, pour all but 1 Tbls. of fat from the saute pan. Add the shallots and cook over medium heat for 2 minutes. Add the beef broth and cook over high heat for 4-6 minutes, until reduced by half, scraping the brown bits from the bottom of the pan. Add the Cognac (I use brandy) and cook for 2 more minutes. Off the heat, swirl in the remaining 2 Tbls. of butter and a 1/2 tsp. salt. Serve the steaks hot with the sauce poured on top. Wine Note: Understand, I am certainly not a wine expert. But, my recommendations are based on selections we have come to know and enjoy. Therefore, I would recommend a good Cabernet Sauvignon or Pinot Noir. Josh Cellars is a lovely California wine. Note: This can be made a day in advance. Be sure to place plastic wrap directly to the top of the mousse. This will prevent hardening of the surface. 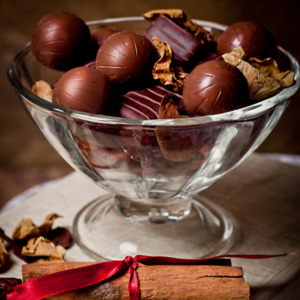 Combine the 2 chocolates, orange liqueur, 1/4 cup water, vanilla in a heat-proof bowl. Set it over a pan of simmering water just until the chocolate melts. Cool completely to room temperature. Whisk in the orange zest and butter until combined. Place the egg yolks and 1/2 cup of the sugar in a large bowl. Beat on high for 4 minutes, or until very thick and pale yellow. With mixer on low speed, add the chocolate mixture. Place 1 cup of egg whites (discard the remaining whites), salt and 1 Tbls. of sugar in another large bowl. Beat on high speed until firm but not dry. Whisk 1/4 of the egg whites into the chocolate mixture; then fold in the rest carefully with a rubber spatula. Using the same bowl, used for beating egg whites,beat heavy cream and remaining 1 Tbls. of sugar until firm. Fold the whipped cream into the chocolate mixture. Pour the mouse into individual serving dishes or 8-cup serving bowl and chill. Serve with a dollop of whipped cream. It is my most sincere wish that you have enjoyed Part I and Part II of, “Romance Is In The Air.” Hold close those you love, and savor all the moments. je t’aime ! Should you need a little extra inspiration for the evening, visit here. Wishing you and yours a Happy Valentine’s Day ! 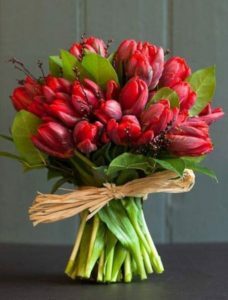 Red tulips are an overt declaration of love ! Steak and Chocolate recipes are from Ina Garten. Vinaigrette is my creation. ← Romance Is In The Air ! 8 Comments on "Romance Is In The Air – Part 2"
That chocolate orange mousse – pinned, thank you! You are most welcome, Rita. Enjoy! Wonderful post. We are staying home and having filet mignon, lobster tails and a salad. Happy Valentine’s Day Sandra! Thanks for the recipes! It all sounds so wonderful…especially the Chocolate Orange Mousse!!! Thanks for the recipes! My Joe LOVES steak au poivre!!!! He had it first in Europe and came home and created his own recipe:) The dessert sounds delicious as well. Have a LOVING Valentine’s day!!!! We decided a long time ago to stay home on Valentine’s Day too — it’s just too crazy and crowded out there to be romantic in any way on that day. Your recipes sound so delicious. And I loved the photos. Love, love that steaming scene with Richard and Jennifer in that movie!! Wishing you a beautiful weekend, Sandra, and thank you for making my world more beautiful.